In large bowl, combine gluten-free flours, baking powder, xanthan gum and salt. Whisk to combine and set aside. In mixer, beat eggs on high for 1 minute until thick. Add sugar and beat for 1 more minute. Add oil, orange juice, zest and vanilla extract and beat until combined. Add flour combination slowly to mixture. Mix until well combined and dough begins to gather together (dough will not be stiff enough to form a ball). Remove dough from bowl, wrap in waxed paper and refrigerate overnight. Dough can be stored in refrigerator for several days before baking. When you’re ready to bake the hamantaschen, preheat oven to 350. Work with a quarter of the dough at a time, leaving the remainder refrigerated until needed, so it doesn’t get too soft or sticky. Using a rolling pin, roll out dough between two pieces of waxed paper to about 1/8-inch to 1/4-inch thickness. If dough is sticky, sprinkle some gluten-free flour on the work surface and knead it into the dough. Using a wide juice glass (or biscuit cutter), press the top of the glass into the dough to cut out 3-inch circles of dough. Gather scraps and reroll for more circles. With a spatula, move dough circles to cookie sheets lined with parchment paper. Put approximately 1 teaspoon of filling (see options below) in the center of each circle. Fold up the sides of the circle to form a triangle (symbolic of Haman’s three-cornered hat). Leave an opening at center of the triangle to let the filling peek through. Pinch edges together to prevent filling from leaking out. 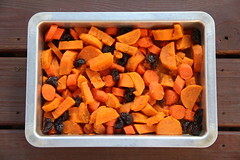 Bake at 350 for 12 to 15 minutes or until edges are slightly brown. Let cool slightly before transferring to cooling rack. I need serious help with my hamantashen. I followed the recipe and used Bob’s 1:1 flour and coconut oil. After last night in the fridge, the dough came out completely crumbly, it wouldn’t stay together at all. I tried adding water, but it just became too sticky. There was no happy medium. I tried adding a bit of olive oil (the only liquid oil I had) and it seemed a bit better but not completely. Could the coconut oil have caused the issue because it solidifies so much or maybe there was just too much flour? Anyways, I need to solve it so I can make these cookies today! Any ideas?? Hi Daniella, I am sorry to hear that they didn’t come out. It’s possible that the coconut oil altered the dough. Coconut oil gets very hard (solid) in the fridge but soft and oily at room temperature. If you take the dough out of the fridge and let it sit out a bit before using it that might help the dough to soften. I hope that works for you! Just made these hamentashen – they are every bit as good are regular ones! I used Erika’s all purpose GF flour mix, and you only need about 3 3/4 -4 cups of flour. These help their shape and are tender. Thank you so much! 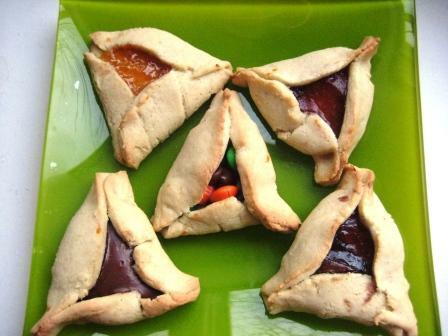 I made these for my synagogue’s Purim celebration this year–they were awesome!! I followed the recipe to the letter, and and used raspberry pie filling. Thank you so much for this recipe. The are the best hamantaschen I’ve had since going gluten free! Amazing! my husband said these were better than any other cookies, with or without flour! Made these today and they are awesome!! The orange juice and zest is a great addition. I used grapeseed oil instead of canola but didn’t change anything else. Used Bonne Maman strawberry, blueberry, and blackberry preserves for filling. Thank you for a great recipe where the GF crust is actually as good as the filling! Yay! Thanks for your comment. I just made these today for the first time. (My first time making any hamentaschen.) They are excellent! They’re very tasty, with a great texture. I used raspberry jam and orange marmalade as fillings. The dough was easier to work with than I expected; it rolled out nicely and was not overly sticky. For the flour blend, I used regular brown and white rice flours (I didn’t have sweet or superfine). I also left out the orange zest, as the house was orange-less. My GF 6-yo is so excited to bring them to her Purim carnival! I will definitely make these again next year. Thanks for leaving a comment. 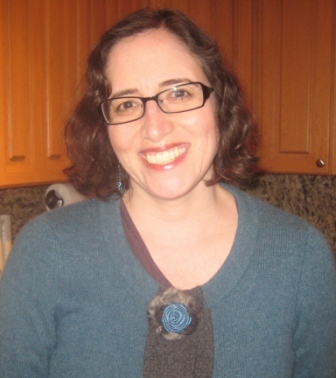 I’m so glad the hamantaschen worked out for you and your 6-year-old! Mmmm … I bet the orange marmalade filling is great. Enjoy! This recipe is amazing! You made my five year old son SO happy that he can have hamentacshen this year! Yay! I’m so happy to hear that your son will get to enjoy hamantaschen this year. Enjoy! They turned out to perfection…beautiful & delicious! (I subbed coconut oil for the canola & used Mama Mia’s Almond Blend GF flour (w/o xanthum gum). Hopefully, there will still be a few left for Purim! Thanks! I’m so glad they turned out “to perfection”!! I love coconut oil, so that’s a good sub. For any of my recipes, feel free to sub your own all-purpose gluten-free flour blend. What kind of fillings did you use? My local grocery store carries everything except the xantham gum. Is there something else I can sub with like tapioca flour, chia seeds, chickpea flour, etc.? Hmmm … if you have sweet rice flour, you can add a little bit more of that instead of the xanthan gum. The sweet rice flour should give you the extra bit of gluiness to hold the dough together. … Or instead of all the various flours, use a gluten-free flour blend that has xanthan gum in it, like Bob’s Red Mill 1-to-1 flour blend. Can you telwake what brands of rice flours you used and what store you usually find them in. What brands of rice flours do you use. Many gluten-free flours are available from Bob’s Red Mill. I use brown rice flour, sorghum flour and tapioca starch from Bob’s Red Mill (or sometimes I buy tapioca starch from an Asian grocery store). I usually use the Koda Farms Mochiko sweet rice flour, which I also find at an Asian grocery store and sometimes at a regular grocery store. Bob’s also has a sweet rice flour on their site. I use Manischewitz potato starch (I buy about 5 canisters during Passover for use throughout the year). If that’s too much for you to buy, then try making the hamantaschen using 4 1/2 cups of a store-bought gluten-free flour blend that does not contain xanthan gum. I like Bob’s Red Mill All-Purpose Gluten-Free Baking Flour, but many other brands are great too. I usually use Arrowhead Mills GF All Purpose Baking Mix for baking etc. I see that you wrote not to use a flour mix that has xanthan gum….this mix does have it. Is it worth a shot using this mix and just not adding the 2 tsp of xanthan gum? If your mix has xanthan gum in it, then that’s fine — just omit the 2 tsp that I call for. But do check the ingredients — I just looked up the Arrowhead Mills Gluten-Free All-Purpose Baking Mix online and it looked like the mix contains gluten-free flours and baking powder, but the ingredients did not seem to include xanthan gum. I usually call for a specific mix of flours because that’s how I like to bake, but feel free to use an all-purpose mix if that’s what’s easiest for you. Baking GF is hard enough — so please do what’s easiest and what works best for you. I noticed the recipes generally seemed to have not enough moist ingredients, and the dough was really hard to work (this is by hand). what do you suggest? Purim is around the corner…. Have you tried the recipe I posted? I had good success with it. 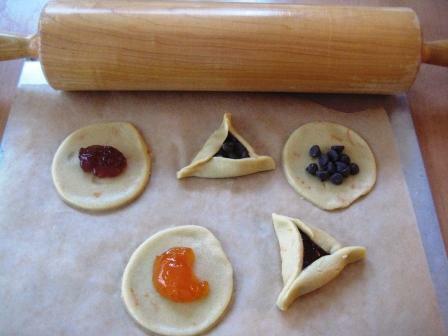 As the photos show, I was able to roll the dough out and shape the hamantaschen pretty easily. I roll the dough between two pieces of parchment paper. If you are modifying another recipe, you might want to add some orange juice or you could try substituting apple sauce for 1/3 cup of the oil and see if that works. Thank you, thank you, thank you. I had given up on making hamentaschen gluten-free, as my family and I call them UFO’s (they are soooo flat). I’m going to try these soon. Your comment makes me think of what my family calls bad bagels — “BSOs,” bagel-shaped-objects. It’s so disappointing when you make a food and it doesn’t turn out well. I think you’ll enjoy the hamantaschen, though! Thanks for your comment. Sounds like a great idea. Easy and quick is always good in my book. Happy Purim (even though it’s over)! H0w beautiful the hamentaschen looked on the cookie sheet! What a persistent, creative, determined pastry chef you are as well as a loving mother!